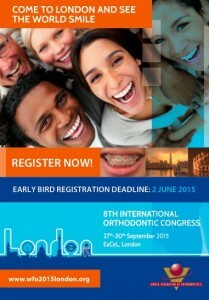 Once every five years, the world’s orthodontists gather to share their expertise and research. The WFO Congress is the only event to bring together the international orthodontic community to celebrate the science and art of orthodontics, providing the ideal forum for orthodontists from around the world to improve their knowledge and clinical skills. The latest Congress takes place this year from 27th – 30th September at ExCel, London with a busy programme for orthodontic practitioners and professionals. It offers the opportunity to meet, network and exchange knowledge and ideas with colleagues and peers from across the globe. Eurodontic and JJ Thompson are incredibly excited to be joining them! If you’re planning to attend, please pop by and say hello. We’ll be joined by our suppliers SCHEU DENTAL and Rocky Mountain Orthodontics, and together we’ll be showcasing some of the world’s very best orthodontic products, materials and services. To find out more about the Congress, please visit the website.